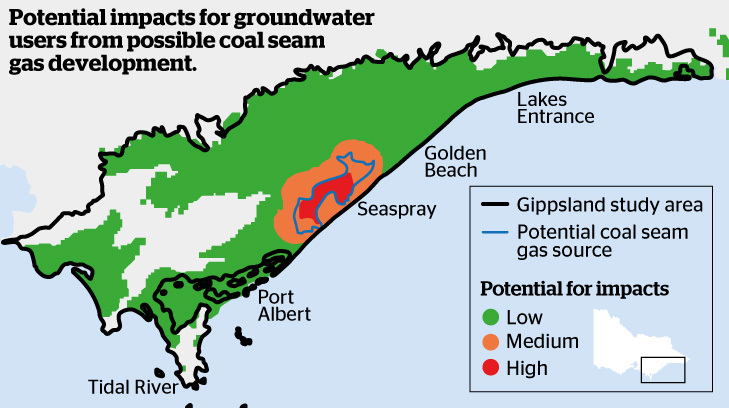 A recent article by Tom Arup entitled ‘Gippsland Water Table Could be Hit Hard by Coal Seam Gas’ (The Age 6.8) outlined a potential drop in aquifers in the Gippsland basin of 15m. 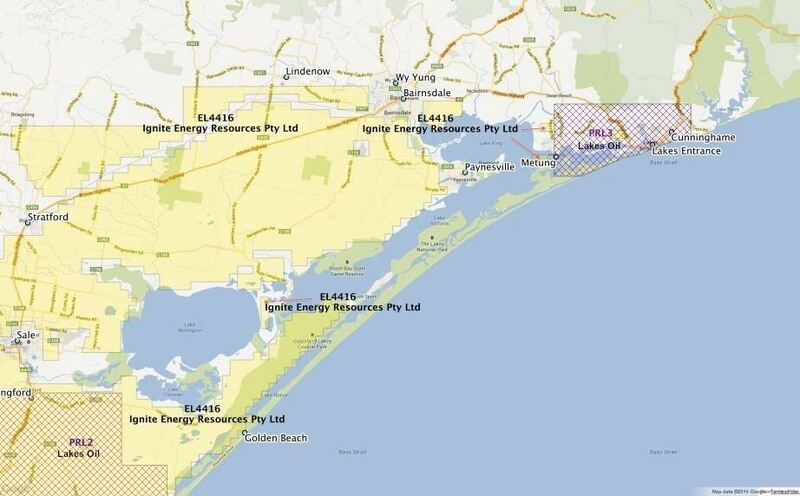 (see map) These predictions form the basis of a government report to the current Coal Seam Gas Inquiry. This report listed that the aquifers may drop from 2-15m as a result of various CSG and other unconventional gas activities. The report outlines the threat of subsidence of land in the highly vulnerable Gippsland basin but considers it low i.e. up to 2m drop. This the report argues is within ‘historical parameters’ and is therefore an acceptable risk. However even a 2m drop in the aquifers ignores other continuing uses of the ground water and that the drain on the aquifers may be cumulative. Parts of the Latrobe Valley have subsided by as much as 2m and subsidence of even a fraction of this on the Gippsland coast as a result of CSG activities may be severe. The other aspect of CSG that is getting little publicity is that it is a direct contributor to climate change and fugitive emissions of methane from pipes and wells probably means that it is as damaging as coal if not worse. That it is being considered at all is an indictment of our political processes. Recently a bioenergy forum was held in Gippsland about the same time as the Senate was passing an amendment to include so-called “sustainable forest waste” in the Renewable Energy Target. This was an unfortunate coincidence. As well a number of the presentations at the forum were dependant on this ‘forest waste’ as part of their process. These should not be considered sustainable in any way or form. With a climate emergency looming preservation of native forests as a carbon store must be a priority. As soon as the forests are preserved and protected this feedstock will dwindle if not disappear. Secondly burning pelletised wood waste still produces CO2 when our aim should be restrict output of greenhouse gases as much as possible. There are at least two ways to do this. The first is using anaerobic digesters to produce methane gas and manure. This process was represented by several presentations at the forum including by East Gippsland water who have recommissioned a digester built in the 1980s. I will comment on this more fully later. The second is the Flannery pyrolysis generator which does not appear to have been represented at the forum. 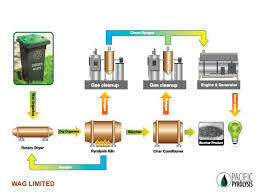 This process produces liquid or gas fuel and has a residue product called agrichar or biochar which is stable charcoal or carbon. Also presenting at the forum was Heartwood Plantations who currently manage 50 plantations in Victoria. They pointed out that bioenergy was quite compatible with their operations but as yet it was not economic to do so. Up to 40% of their product would be available for bioenergy and cogeneration (heat and power). Since we need to phase out native forest logging we should be encouraging operations like these as much as possible. With the above provisos in mind we concur. Gasfield Free Bairnsdale (GFB) was formed by local residents in November 2013; we are all volunteers. When we heard there was a huge exploration mining licence (EL4416) for unconventional gas mining in our area, the biggest licence in Gippsland, we decided to hold a public meeting and information night in Paynesville on 5th December 2013. Over 150 people attended. As a result of attending that meeting, members of the Meerlieu & District community requested a public meeting for their community; this was held at the Meerlieu Hall in February 2014. Local residents have been door knocking where there is an exploration mining licence to inform landholders about the licence and to ask a survey question, “Do you want your land gasfield free?” Lock the Gate signs have been sold and put on gates where landholders chose to do this; this is a “no trespass sign” to mining companies. When the surveying has been completed, community declaration events have been held to present the outcome of the survey question. So far over 600 yellow triangular lock the gate “no trespass” signs are on gates and 2 declaration events have been held: the first was on 5th October 2014 at Meerlieu where 450 people were surveyed in the districts of Perry Bridge; Meerlieu; Goon Nure; and Bengworden. 98% of the survey respondents said “no” to gasfields on their land. Over 200 people attended and participated in a “No Gasfields” sign made from utes. The second declaration was on 12th April 2015 at Eagle Point where 207 people were surveyed in the districts of: East Bairnsdale, Nicholson, Broadlands, Newlands Arm & Eagle Point. 98% of survey respondents said “no” to gasfields on their land and over 130 people attended the declaration. Another 100 people have been surveyed in Forge Creek. Surveying will be completed there and in: Hillside; Calulu; Wy Yung; Bairnsdale (district not town) and Lindenow in the next couple of months. A total of over 750 people have been surveyed where there is an exploration mining licence on their land, with 98% of the respondents saying “NO” to gasfields on their land. The movie “Frackman” screened at the Bairnsdale Sun Cinema on 6th May 2015. 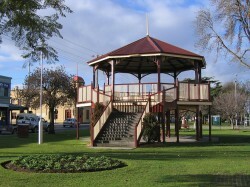 Bairnsdale had the largest audience in Victoria with 177 of the 200 seats filled. Senator Ricky Muir attended and spoke during the Q&A session (at the Senator’s instigation). 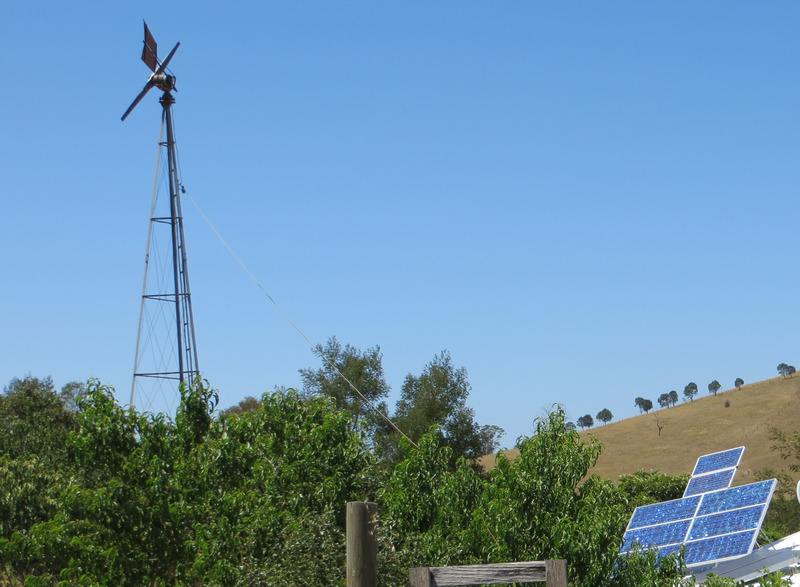 Initially my house up the bush was powered by wind and wind remained its major source of power for many years. The reconditioned 300w wind-light generator resurrected from a farm by Tony Stephenson of Going Solar was installed in 1982. To minimise power loss the generator tower was built as close to the house as possible – uphill and about 15 metres away. Aside from manually turning the blade off and on – the former when there was too much wind and the batteries were fully charged – there was minimal work involved. Two small solar panels were added to the system in 1986. Due to major maintenance requirements after 18 years operation wind was replaced by 500w of solar panels. Since decommissioning (about 2000) the windmill blade has been turned off.Now aged 70 my knees have gone – probably from either from living too close to the turbine or from having to climb the 30 foot tower once a year for the generator’s annual inspection. With all this experience of living right next to a wind powered system and such obvious health affects I wonder why I wasn’t called before the Senate Wind Inquiry? Unfortunately the spinning and invisible blade at high speeds also killed the occasional magpie. The mortality rate of the magpies – about 1 every 2 years was about the same as those for birds flying into the windows of the house. This affected a range of species including some smaller varieties. Perhaps windows should be banned too? Overall though I remain a wind fan at heart. These wind-generators – of which our PM and Treasurer are so enamoured – are the real threat to local coal fired polluters. Formed in 2007, the Gippsland Climate Change Network Inc. (GCCN) is an incorporated not-for-profit network of approximately 50 diverse member organisations across government departments and agencies, private businesses, community groups and other organisations, covering the six local government areas across the greater Gippsland region. The GCCN mission is: “To provide Gippsland, at an individual and organizational level, information, consultation and facilitation to enable action on climate change, whilst also providing a voice for Gippsland on Climate Change issues” and the three pillars of action are through Informing – Connecting – Acting. The Gippsland Climate Change Network (GCCN) looks forward to working with the new State Government through its commitment to Climate Change Action. If you know of anyone or any organization that would benefit from being on the mailing list please contact Beth Ripper on Email eo@gccn.org.au to be added to the email list for future GCCN ENewsletters. The recent divestment day in Bairnsdale was well attended – despite news reports – with a maximum of 18 individuals. This compares quite favourably with the 8 we mustered in Sale more than a year ago. I attended that rally – organised by Gippsland 2020 – mainly in a support role as I had already either closed down or changed all my accounts with the NAB to the Bendigo Bank. However I did have in my wallet my one and only credit card which I had not done any preparation to change. And of the 8 hardy souls in Sale that day none had an account to divest other than yours truly. Rather than the day being a complete washout I volunteered my piece of plastic. After a brief discussion and presentation of letters to the manager of the Commonwealth we crossed to the NAB where I duly cancelled my card. Outside the day was saved by Gippsland 2020 founder Morgan Knoesen taking a video clip of me acting the fool cutting up my card and spouting on about my lifelong association with the NAB (and the CBC of Sydney). All true as I had opened my first account with the new CBC of Sydney branch in Ashburton – sometime about 1960. The clip made it to the market forces video of the day and somehow made it all worthwhile. Now I bank solely with Bank MECU and the Bendigo. And I still have no credit card. In the 2007 election “Ruddslide” Australia’s first and only registered single issue climate party – the Climate Coalition – performed disastrously. Despite having some outstanding Senate candidates like Doctor Karl and Clover Moore in NSW they all ended up performing badly and losing their deposits. By the time I got around to trying to join this party the following year it had already imploded and disappeared. So from my isolated outpost in the bush I attempted to form the Global Warming Action Party Australia. Close friends were rightly critical of the acronym GWAPA. “Sounds like a frog croaking” my daughter said. This attempt was even a greater disaster as after several years it had gained only a very small membership. Eventually it too folded. Yesterday (Friday) was a great success! 18 people showed up, we talked about divestment a little, then I went to the Commonwealth to shut my account. Apparently we presented a pretty formidable group, as the police were called immediately! Note: it’s a great way to get quick service, they really wanted us out of there. We were very reasonable, and the Bank manager was great, listened to our purpose with interest and promised to take our message to the higher-ups. I cut up my card and we proceeded to the other 3 Banks, ANZ, NAB and Westpac, taking a bunch of photos and having good conversations along the way. Thanks so much to everyone who came! Those who couldn’t make it, you can still do plenty in your own time. Farmers Against Fracking Melbourne Declaration! 12 noon Sunday 20th September. We are taking our message to the city again, we need 1000’s of people to send a clear message to the state government that gasfields are not welcome here! Melbourne CBD, location to be confirmed. Stay tuned, more details to follow! Do you have an account in the National, Westpac, ANZ or Commonwealth Banks in Bairnsdale? Are you aware that all these banks are active in supporting coal and other fossil fuel developments around Australia? Burning coal has been identified as the major human contribution to the increasing Carbon Dioxide in our atmosphere and thus of climate change. By banking with them you are supporting these developments. The answer is to change banks in what is currently called the divestment movement. The divestment movement is educating people about the relationship between their personal finances (both banking and superannuation) and climate change. By diverting your accounts you are helping persuade the banks to change their loan strategies. As well you no longer personally contribute to them. Have you a credit card to cut up or an account to close? Please support the divestment movement in Bairnsdale by meeting at the Rotunda at 10am on 10 July.